A Weekly Challenge to Whet Your Crafting Appetite! We are a group of great friends from all over the place, who wanted to start a stress-free challenge site. This will be a weekly challenge, and there will always be something here for you to see or try. Individually, as designers, we may not all be here every week because we are busy just like you!! So 'take the plunge' when you can or stop by to be inspired, even if you don't have time to "play". Make sure you don't miss a week of inspiration by subscribing to our site on the right! This week we want you to think Tall and Skinny! Any card you create that is taller than 5 1/2 and thinner than 4 1/4 is considered Tall and Skinny...however, 3 1/2 x 8 inches fits a readily available legal-size envelope from any office supply store! 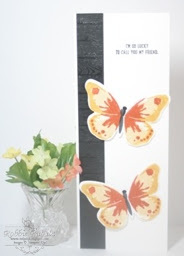 This is a fun card to make with more space to fill! We look forward to seeing what you will create! Dive on IN!! 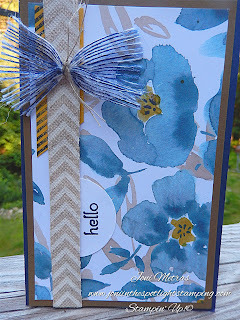 Upload your project to your blog, and link it back to us - please be sure to add our info into any public galleries where you may post (Pinterest, Facebook, Stampin' Connection, etc...). Please provide a direct link to the post featuring your challenge entry. If you need help with this please comment to the post and we will help you... If this isn't done, we will sink your entry! Your card or creation should not be entered in any more than three challenges - including ours! Create a NEW paper project, flat like a card, or 3-d is fine.Please use this tool to add your creation here! Thanks for taking the Plunge with us this week! Be sure to play each week - you never knew how fun this could be! This challenge will close next Wednesday at Noon (Central time). Don't miss a thing! Get updates delivered right to your inbox! Like to play? Grab our Badge! Who is Checking Us Out? ?